The world is changing. It might be due to natural cycles of temperature changes that landscapes are becoming arid and uninhabitable, that the pH levels of bodies of water change and kill off organisms within – it might even be human intervention, with over-fishing, polluting and destroying habitats. With a changing world, what we need (simply as a response) is a food revolution. At least since 2013, the UN has urged the world’s population to source their protein from sources unfamiliar to Western stomachs – though apparently four in five countries in the world still do this to a certain extent: insects. Popular culture vehicle for science, IFL Science, notes that this shouldn’t be a problem, as in all likelihood you’ve already been consuming insects, though not in ways you imagined. 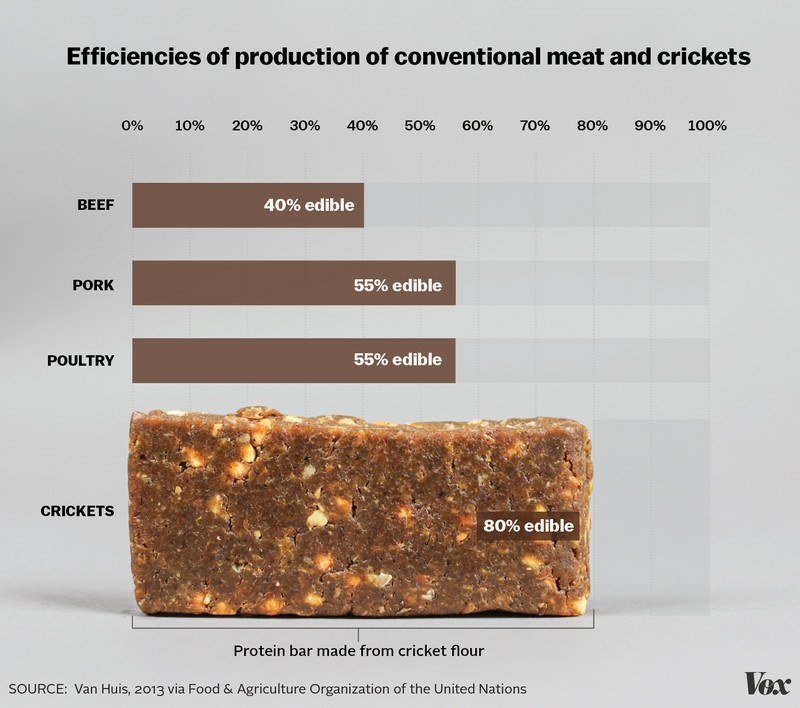 Not only are bugs like crickets more nutritious than conventional meats (per 100g of “meat” there’s more than double the protein than in chicken, for instance); but they are more ubiquitous; due to space demands, they are easier to farm; and they are less fuel-intensive. The way they are portrayed in this Mic article also makes them very hipster-friendly, as different ways are explored to make insects appeal more to the normal consumer; they have also begun to marketed to health- and fitness fanatics by being integrated as ingredients, rather than the more quease-inducing thought of the insect as the meal itself. I am fascinated by the assumption that lab-grown meats can be put on the same level as insects in the fear-factor, but maybe I’m just one of those young people with less defined eating habits… or maybe Boland is just projecting, as a study reveals that 65% of people surveyed in the States would give “in-vitro” or “cultured meat” a try. They’re culturally not too far off from British tastes, I would venture to say. The technical process did/does require refining: ‘too meaty’ perceptions of first trials in 2002 revealed that fat content was at first not considered, but very important to the flavour profiles. More than a decade later, fake chicken is still considered spongy in texture. Regulations, too, require updating – whether in reference to insects or lab-grown meats. Mark Post, the originator of this wave of lab-grown meats, predicts it will take 3-4 years for his type of product to reach the market, and another 3-4 to be accepted in the market. Competitors are likely to be on similar timelines, despite what they proclaim. I have to admit that I’m queasy about eating crickets by the shovel. But I can see myself eating baked goods using cricket flour. It’s akin, to me, to eating any other food with an unsavoury ingredient without it being visually obvious. But I am most excited for lab-grown meats, as an avowed meat-eater, and I’ll be scouring the supermarket shelves in a few year’s time for sure, if the price is right (sorry, planet Earth). What future food trends are you excited about?